Get up and go with Easter break here! By day the activities can be action packed or less. 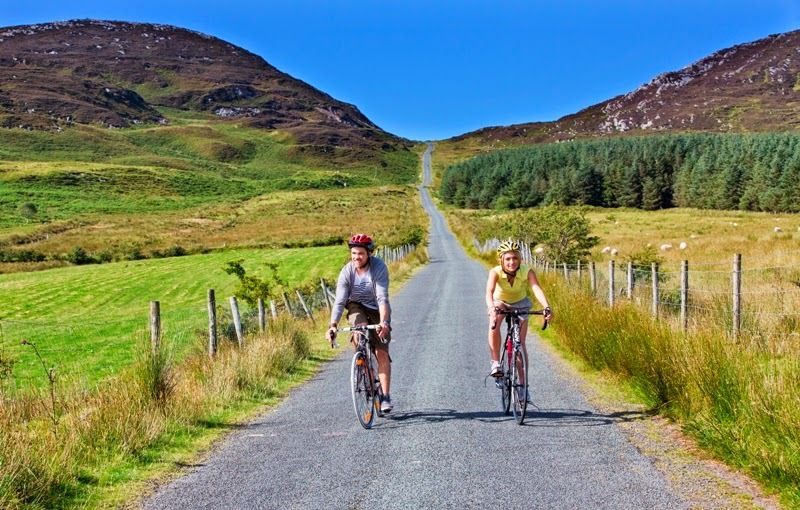 Cycling is just one of the pursuits that boost the entire health and wellbeing of the visitor while holidaying in Inishowen. By night, the “craic” is not to be missed; local bars and restaurants bustle with energetic exchanges of local tales, hidden gems, and experiences of discovery. Rest those weary legs over a Guinness and get that feel good factor that only natural physical fatigue can provide. 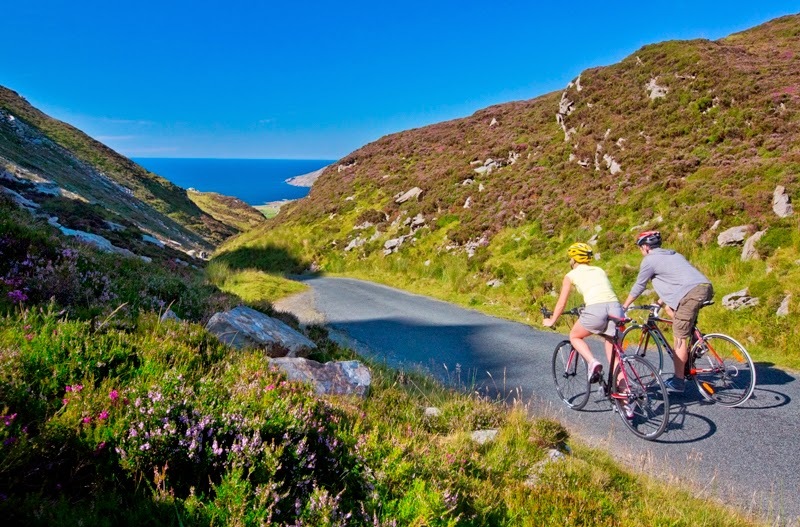 Cycling, the Inishowen Peninsula makes for a journey of exploration that encompasses all the spectacular sights of the landscape that this section of The Wild Atlantic Way has to offer. Cycling is an enjoyable means of experiencing those activities, attractions en route. Interestingly, According to Failte Ireland insights, when asked what makes a good cycling destination, cycling attributes were not priorities for people. Cyclists have a route which takes visitors to places of interest, with plenty to do and see on the way. Scenery and landscape, attractive towns and villages, where less traffic, safe zones, and more picturesque pit stops were available were specifics desired on preference. A cyclist taking a tour of Inishowen, stated, “The scenery was incredible, even through the rain. Every turn in the road brought new wonders, stopped at a lovely spot, delicious lunch with a great view. Then the sun came out, as if on cue, and we relaxed on the grassy hillside overlooking the ocean, and dried off in the warmth of the day”. 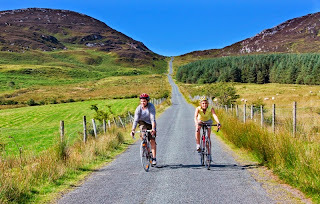 Other reviews sum up cycling in Inishowen such as “Definitely one of the highlights of our two week trip to Ireland”. The unique situation of Inishowen between two sea lakes and the wild Atlantic Ocean has brought about a widely varied landscape and incredible scenery. Most people don’t have the time to cycle long distances in Ireland, Inishowen is a great ‘Ireland in miniature’ to discover at leisure. As starting point, the Grianan Aileach first so they can get the aerial view of Inch and see the route from above, and then follow it up with coffee or lunch in the hotel. Inch Wildfowl Reserve is a beautiful trail, although shared with pedestrians; suitable for the less confident cyclist, children ideally leisurely exploring. An 8km loop utilising parts of the old railway track, accessed from 3 car parks. The loop includes the bridge onto the island, the 'causeway' between the lagoon and the Swilly, and is roughly half on the island and half on Inch Levels. Bird watching huts are ideal stops to bring binoculars and take a break. Carn, Malin, Culdaff is mostly flat and will take most leisure cyclists less than two hours. If describing the best way for locals I would recommend taking the moss road and the corvish road to re-join the main road at the brahan house. This just cuts out half the main road which is more enjoyable, and most Inish times' readers should be local, but maybe that's too detailed. The route is pretty self-explanatory, from Carn head to Malin and turn right at the green onto the Culdaff road. Follow this all the way into Culdaff and keep going until you reach Bocan church. Turn right there alongside the hall and past the Cloncha Church. This road joins up with the Moville to Carn main road, turn right onto it and you will find yourself back in Carn in no time. I have attached a picture of the inside of the Church here, there is also a high cross in the next field and anyone very interested in that kind of thing could also visit the Carrowmore site while they are there. And again for additional ways to spend their money they could take a break at Lily's, the Malin hotel, McGuinness' or McGrory's. Anyone feeling very active could include a walk on the beach, or use the picnic area there. There is no bike rack but there are some signs you can lock a bike to. Moville Loop - Obviously the idea of 'difficult' varies depending on how much cycling you do. This is my difficult suggestion for people getting into cycling; if you're a club cyclist out every weekend this is just normal, but for that level of cyclist 'difficult' would mean the Inishowen 100. If that's who you're writing for then I would recommend the 100, or else the national cycle route over an Grianan and into Derry. But if you're writing for non-cyclists trying to push themselves this is what I would go with - and it gets in a bit of East Inishowen. Leaving Moville follow the Inishowen 100 route out of Moville, up through Greencastle and Shroove. This first bit is your warm up, the difficult section is ahead. From there you climb over Cnockaulin and into Kinnago, which has some nice steep twists and turns in it. Coming up out of Kinnego instead of following the 100 towards Tremone, which is a right turn, you stay with the road. This brings you back onto the Carn to Moville main road and it's a nice descent into town. Shroove beach is Blue Flag, and the beach at Kinnego is obviously gorgeous. This route takes you past the castle and the lighthouse, and I've attached pictures of them. I'm afraid we don't have any reviews for this as we don't generally get customers looking for difficult routes! June sees Inishowens section of the Wild Atlantic Way highlighted as the challenge that committed cyclists dare to take on the journey Mizen to Malin. This is the classic Irish Challenge cycling from the southernmost point to the Northern most point in the land. The distance between these two extremes is almost exactly 400 miles (640km). Our route will be seeking to stay away from main roads and maximize the scenery that is on offer, whilst at the same time avoiding adding extra kilometers to this already challenging ride. Inis Eoghain Cycleway- is a 55km loop connecting The River Foyle in County Londonderry to Lough Swilly in Donegal.